This is the second of my new and ongoing series of posts on recommended ramen restaurants in Fukuoka. This shop’s owner gained valuable experience working in the famous Taiho Ramen (大砲ラーメン) chain from Kurume and opened Ippo after receiving permission from Taiho’s owner. Rich, meaty, garlicky broth, combined with noodles made to match and just the right balance of ingredients makes for some delicious eats at Ippo. With Kurume origins (a place some consider to be the ramen mecca of Fukuoka Prefecture), the soup is particularly kotteri and flavorful. 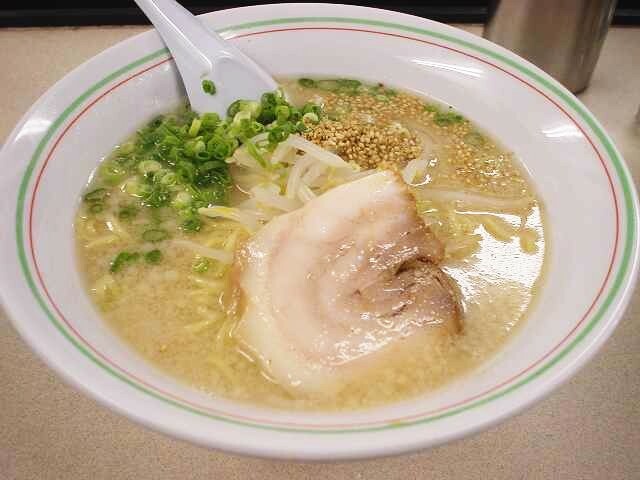 Furthermore, Ippo’s ramen is absolutely perfect after you’ve had a few too many drinks and, like most Fukuokans, crave a hot bowl of savory ramen — its location in Haruyoshi, near both Tenjin and Nakasu, makes it convenient for this purpose. This entry was posted in Food and Drink and tagged best, budget, cheap, dining, food, Fukuoka, Fukuoka blog, gourmet, Hakata, haruyoshi, Hirao, inexpensive, ippo, Japan, Kyushu, Kyushu blog, noodles, ramen, ramen stadium, recommended, restaurant, stadium, Tenjin, tonkostsu, Tora-ya, Toraya, Watanabe, Watanabe-dori, Watanabedori, Yakuin. Bookmark the permalink.